Many people in the community think of dementia as mainly losing one’s memory. They do not realise that there is a fairly predictable pattern where people in the end stages of dementia gradually lose all the functions that sustain life. This includes the abilities to recognise people, communicate, eat, get dressed, walk and move about independently, control their bladder and bowel, and swallow food and fluids. 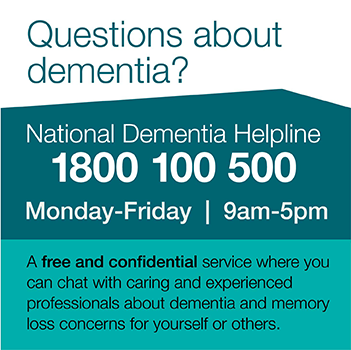 Understanding dementia in this way helps loved ones to prepare for the gradual deterioration of the person with dementia and some of the decisions about care they may have to make in the future. In the past, ‘palliative care’ was something that occurred only in the final days of life and was mainly aimed at people with cancer. More recently, a palliative approach to care has been promoted and begins earlier than in the final days of an illness. It is also relevant to many illnesses other than cancer, including dementia. A palliative approach to care focuses on managing a person’s symptoms when there is no cure for their condition. The goal is to improve the person’s comfort, function and quality of life rather than to extend their life at all costs. Attention is paid to their emotional, cultural and spiritual needs as well as their physical needs.